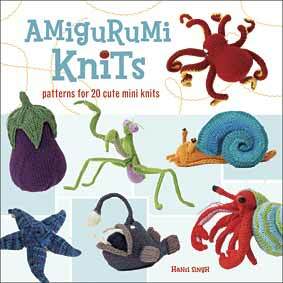 It may be unnecessary to say this for those who know me, but I have recently become obsessed with amigurumi knitting. You can knit your own toys! It's awesome! How many children out there have a stuffed eggplant? I would challenge you to find one. Plus, it's so well-constructed. ;) It's soft, there aren't any parts that will pop off and choke him, and it's got a really fun stem that he can chew on and hang on to so he can swing it around and hit people. In any case, I highly recommend this book as it is wonderfully fun and quirky, and Hansi Singh is a friggin' genius. Yes, some of the patterns seem pretty challenging (I love to read knitting patterns before bedtime), but challenges are fun! It always feels good to accomplish something like this. Happy knitting! You made that eggplant???? Can I order one from you? I love it! You might have to add these to your papercrafts site! I absolutely love it! I just want you to know that I am willing, and available, to travel up to 3000 miles in one direction to play with your son for whatever amount of time might be necessary. Thanks, guys! I'm glad you like it. It was a blast to make. Anika, just say the word. :) I love that pattern!